Gospel influenced vocals with a funky organ jazz accompaniment performing traditional jazz standards and pop tunes of more recent vintage. Most of the time, the quickest way to mess up a good instrumental jazz band is to add a singer. But we have a brilliant exception to that rule in Kansas City. Organist Ken Lovern’s OJT (that’s Organ Jazz Trio), with guitarist Brian Baggett and drummer Kevin Frazee, is one of the most exciting units in town. These days they’re working with singer Bukeka Shoals, a gospel-inspired belter whose taste and control put many others to shame. One well-placed note from Shoals can do more than dozens of notes from soul-singer wannabes. She has an enviably wide range, so in the register where others are shrieking, she’s singing real, true notes. The band’s grooves are sweetly old-school and subversively funky. Lovern’s organ playing keeps everything centered and moving forward. Baggett’s flow seems unstoppable, and Frazee’s grooves go deep. Personnel: Bukeka Shoals, vocals; Ken Lovern, Hammond organ; Brian Baggett, guitar; Kevin Frazee, drums. Recorded, engineered, and mastered by Ryan Kleeman. Produced by Ken Lovern and Ryan Kleeman. Music arranged by Ken Lovern. Vocal arrangement on “Middle of the Road” by Bukeka Shoals. Jazz Daddy Records, 2006. 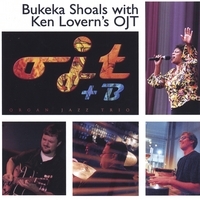 On track three of this new album, the classic “Night and Day,” Ken Lovern's Organ Jazz Trio (OJT) begins with a melodic tom-tom introduction in which Bukeka Shoals, the featured vocalist on the album, sings a haunting version of a lost first verse from this classic tune. The group's sensitivity to this verse verges on musical theatre with the “tick-tock of the clock” of the verse coming also from the organ and drums. Lovern said that the group tried hard to represent what was happening in the lyrics in the instrumentals that back them. He mentioned imitating the clock's tick tock, and he also spoke of the lost verse. “You don't usually hear that verse,” said Lovern, “and that adds a lot to that tune.” And the tune is exquisite in its blend of instrumentals and words. This tune represents the album's overall seamless juxtaposition of old and new, classic and pop, and blues and jazz. Plus, it is accessible. Half of the album is jazz standards, and half of the album is pop tunes. “It's good-time music,” Lovern said, “music for the people.” This sums up well the appeal of the album, which is jazzy, with numerous great solos by Lovern and guitarist Brian Baggett, but also with an attention to the hard, bluesy groove Bukeka brings to the album. It is a groove complimented well by Lovern's organ work, which is mellow but driving, and always upbeat. Although the organ trio—with organ, guitar, and drums—is not entirely unique in the jazz world, since groups like Wes Montgomery's had this configuration, Lovern said that adding a singer makes the group unique. Lovern called the combination of an organ jazz trio with a vocalist a “warmer, unique sound.” He added that the bluesy feel of the group, including a dynamic vocalist, has granted a wider appeal in terms of the group's audiences. Speaking of how some audience members are drawn mainly to the human voice, and not to the instrumentalists, and come primarily to hear the singer, Lovern said, “People relate to the singer.” With Bukeka in the line up, Lovern said that more of the mass of his typical audiences seem to stay longer during the breadth of each set. Some people just love a singer, I guess. However, this says a lot for Bukeka's strong vocal presence as well. Also, the pop element is exciting, and it is a draw. In some ways, bringing contemporary pop tunes into the jazz idiom has become, for some, a lost art. However, guitarist Brian Baggett appreciates this fusion of contemporary music and jazz standards in their sound. The OJT+B will hold CD release parties on Fri., Aug. 18, at the Center for Spiritual Living, and Mon., Sept. 25, at Jardine's. Oh, and you can listen to tunes from the album at www.myspace.com/ojtplusb or www.KenLovern.com. Bukeka Shoals has delighted audiences for years with her powerful delivery and uplifting presence. Her compositions have brought joy to many people both through her live performances and her debut record, “Bukeka.” Now, she brings these same qualities to an eclectic and style bending jazz setting by joining with Ken Lovern’s OJT (Organ Jazz Trio) for this set of 9 songs. With original arrangements in that funky organ jazz groove, Bukeka radiates her vocal magic over the superb accompaniment of the OJT. About half the songs are traditional jazz standards, the other half are pop tunes of more recent vintage. Bukeka makes them all her own on this superbly recorded release. Enjoy! 1. Big Yellow Taxi: A great folk tune from the late 60’s, OJT gives it the old organ jazz shuffle, Kansas City Style. Bukeka makes the vocal melody her own. 2. T’Ain’t Nobody’s Bizness: The first of several tunes on this recording associated with the inimitable Billy Holiday – Bukeka’s strong vocals, however, owe as much to the legacy of Ella Fitzgerald as Lady Day. 3. Night and Day: This standard of standards begins with a thundering floor tom introducing the too rarely performed verse. The group employs a Latin feel for the majority of the tune. Check out the fade by the band. 5. Fat Daddy: This blues made famous by Dinah Washington in the 1950’s is an ideal vehicle for Bukeka’s storytelling delivery. The solos kick it old school with Brian barking our some blues licks and Ken pulling out the “Wild” Bill Davis stops. 6. Middle of the Road: The group adapts some 80’s attitude into a boogaloo version of The Pretenders’ working class rocker. Bukeka’s shows her versatility with the harmony parts. 7. God Bless the Child: The group endeavors to deliver a fresh version of this Billy Holiday classic. Bukeka demonstrates her wide dynamic range in this exciting performance. 8. Venus: This tune does pre-date the Banarama dance hit of the 80’s. The European group “Shocking Blue” wrote and recorded the initial version. Bukeka and the group pay homage to the booty shakin’ dance ancestry of the tune and groove it all the way through. 9. I Love’s You Porgy: The final track is a hushed yet powerful version of this sad and beautiful song from Porgy and Bess. This arrangement owes more to the Nina Simone version than the older Billy Holiday jazz adaptation. The group’s delicate ending utilizes the dynamic range possible in the recording studio. Fantastic! Bukeka demonstrates only part of what she can do! The CD is made up of fun cover versions of classics. Bukeka and the band show energy and interesting takes on each song. I was listening to this in my office and several people stopped by and wanted to know more about the band and/or the singer! Keep up the good work and keep working together!